1. In a large pot bring 6 cups of cold, salted water to a boil. 2. While the water is beginning to boil, wash the kale and cilantro thoroughly in cold water. Remove the leaves of the kale from the stems, lay them on top of each other, roll them up and slice them into 1" strips. Set aside to cook. Chop half a bunch of cilantro and set aside. I prefer only the leaves, but if you like a stronger cilantro flavor, chop up and include the stems in the recipe. 3. When the water comes to a rolling boil, add the kale leaves into the pot. You may need to add the kale into the pot in batches, so that the leaves wilt down and create room for all of the kale. 4. Boil the kale for 15 minutes, until all the kale is wilted down and is shining bright green. 5. Drain the kale out into a strainer, but reserve the kale water to make the moong dal. 6. Combine 3 cups of the hot kale water and the moong dal into a small saucepan. Place a lid on top of this pot and bring to a boil over medium-high heat. Watch this process as the water/dal mixture will tend to boil over very quickly. Once the dal has come to a boil, reduce to heat to a simmer and cook for another 25 minutes. 7. 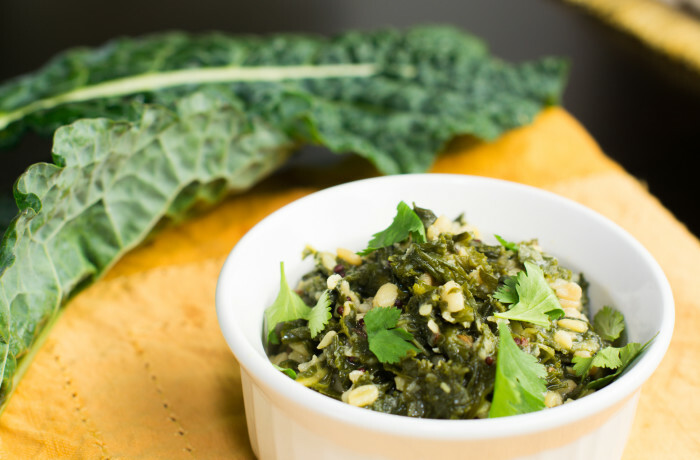 While the dal is cooking, place the wilted, cooked kale onto a cutting board, and roughly chop the cooled kale. The more you chop it up, the better. 8. After the dal has cooked to the desired consistency, turn off the heat to the small saucepan. There should be water remaining on top of the dal. 9. Using the large pot in which you boiled the kale, heat vegetable oil over medium-high heat. Add mustard seed, and wait for it to begin to pop. 10. Add cumin seed, urad dal, crushed red pepper and salt. Cook until cumin seed is aromatic. 11. Add chopped kale and cilantro. Cook through for 2-3 minutes. 12. Add the entire moong dal mixture from the small saucepan, including the water. Continue to cook through for 5-7 minutes, until all the flavors marry. Season with salt if necessary. ***The final product will be more kale than dal, and not that soupy. If you prefer a soupier dish, you will need to use much more water to cook the lentils, and perhaps less kale. You can adjust this ratio, but you will also need to adjust the spices/salt accordingly.